TekMat began on a whim when Dan, inventor of TekMat, was cleaning his AR-15 on his dining room table using his wifes dish towel as a gun cleaning mat. After many ruined towels, she got fed up and bought him an official gun cleaning mat. The gun cleaning mat she purchased was little more than a long piece of felt. It stained easy, it wouldnt stay in place on the table, and little pieces of fiber kept getting stuck on the greased parts of the gun. 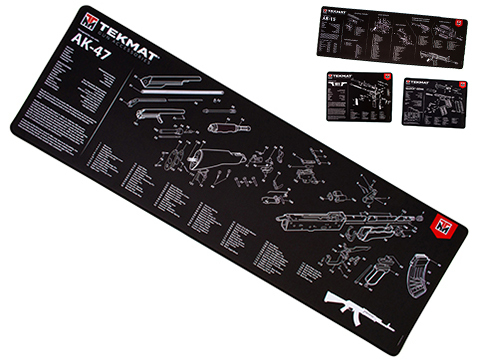 This is when Dan decided to make the best gun cleaning mat.The mat that Dan designed is what is now known as a TekMat. It has a soft thermoplastic fiber surface that will protect your firearm and wont stain from grease and oil. The neoprene rubber substrate gives TekMat the padding you need to keep your gun, as well as your kitchen table, safe from dings and scratches. 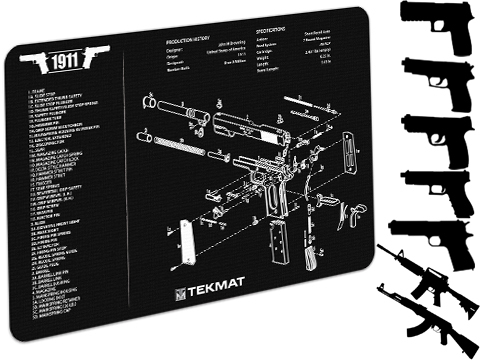 And to take it one step further, TekMat was designed with an exploded parts diagram of your firearm so you could take the gun apart to clean it, as well as put it back together without ever having to try and find the owners manual. TekMat's use a dye-sublimation printing process which embeds the ink into the surface material so you dont have to worry about the printing coming off the mat. We consistently add new firearm models and update the older styles as manufacturers update their designs.